What did you think,I would have a picture of a gun? To those of us who are old enough to remember; the title of this blog piece is a line from a famous song by the Guess Who. To those of us old enough to vote that line may well be the ballot box question during the Canadian federal election in October of 2015. As of right now the cops and the military need guns to protect the people from the bad guys. Add to that the farmers need guns because they are to far away from the cops and the military to get quick help and you have a formula for a another Conservative party of Canada win. Everybody always says it’s the economy stupid and this will be no different. After all if everybody is safe and sound and buying guns won’t the economy just hum along. What do you think the ballot box question will be? This is a lawn sign, cool eh! How cool would it be to have one of those brand spanking new lawn signs on your front lawn just in time for the good weather! It can be yours for a mere $6.30. The good guys ( the would be the Notranslinktax guys) don’t have the resources that the yes folks do. As I said above “each lawn sign costs about $6.30 when the cost of the plastic, the wire frame and the taxes are included. And we need lots of them – can you help us buy a few lawn signs? Just click here to buy lawns signs using our secure online form. It’s time we said enough is enough. 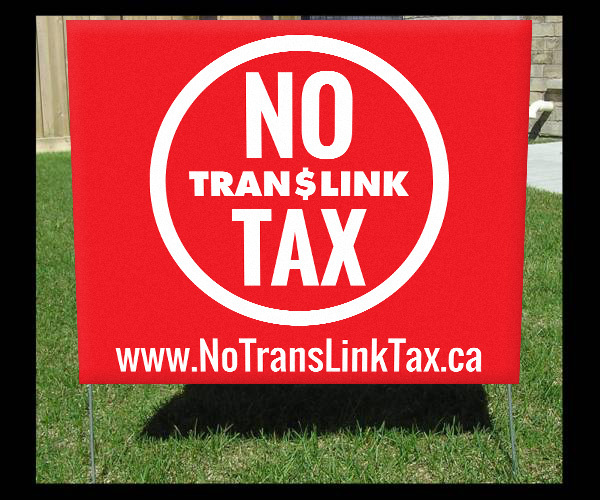 It time we said FIX TRANSLINK first and then ask for our money! It’s time to Buy a Lawn Sign and Vote No!